Here are some more pictures of our little sweetheart. We're really enjoying her, and I just wish I could get some good pictures of her great big smiles. That will come, I'm sure. 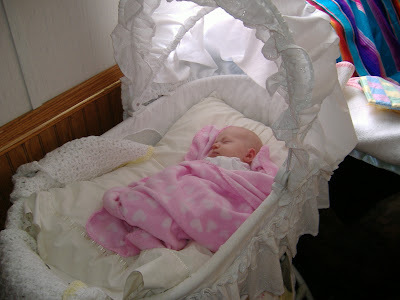 Last night (Wednesday) we took Hannah to church for the first time. She was as sweet as could be, and behaved quite nicely. 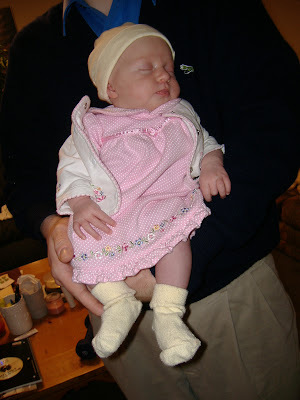 The outfit she is wearing, was given to us by the Elliott family. We love it on her!! 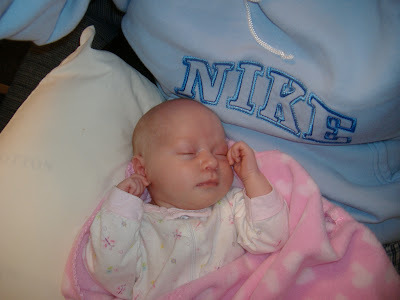 Here she is sleeping again, this time on mommy's lap. 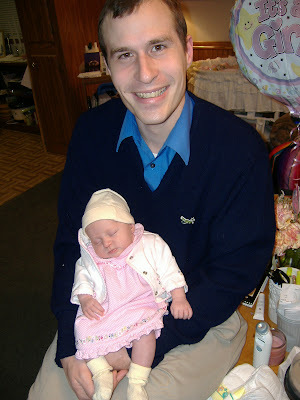 And last but not least, here is Daddy with his little girl just come home from church. So sweet!! The flowers and balloon were given to us by an out of state friend. Thank you Anna!! Oh, very cute pictures!! She looks so sweet. Awww! Thanks so much Bethany. Hannah is the cutest little doll!Love the pics!!! !